Meet the authors: If vintage tee addiction is hereditary meet the proof in the poly-cotton pudding. Brothers Patrick and Marc Guetta own and operate the decade old World of Vintage T-Shirts store on Melrose Avenue in Hollywood. 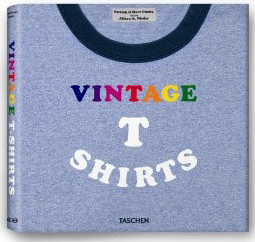 Welcome to the closest thing to a vintage t-shirt bible you’ll ever find. In 2008 we gave that honor to a book by the same name that contained over 500 tees, but then along came this beast which trumps it by 150. Not only that, the pages are actually about 1/4 larger so you’re getting more bang for your buck. 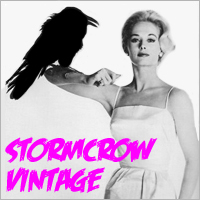 And bigger is definitely better especially because it’s showcasing a vast array of vintage tee genres, rather than just a music related ones. If I judge this book solely by the cover, it’s perfect. Great fold out, die-cut raised detailing on the tee’s ringer and raised printing for the home-made style lettering. No, you sicko, the lettering doesn’t have a fuzzy feel to it, although I wouldn’t be surprised if it was a consideration. None of the other books put as much creativity in to their appearance. The write-ups banked in the early part of the book are ok, but after reviewing five books previous to it I’m jaded. At this point there’s nothing new anyone can say about a glorified piece of cloth that Marlon Brando popularized. And since the authors are imports from France there’s also French version of the write-up, which is not foreign to me given I live in a bilingual country. Don’t worry those pages aren’t wasted with duplicate photos, so for everyone who isn’t fluent in French (including me I dropped it after grade 9, oops) you still have something to gawk at. Relax, there’s not a lot of reading to do. After the final sentence it’s strictly tees for 350 pages. The concert tee section won’t blow your mind if you’re a vintage aficionado. I sold many of them during my days as a dealer which is something I can’t say about the contents of Ripped or Vintage Rock T-Shirts. But the book does a bang up job of touching on all the good things in life: sports, cars, surfing, booze, beer, movies and tv. Hell there’s even a fantasy and video game section PLUS Maiden and Harley receive extra attention. Great torsos think alike. The downside to its size and special printing is that the book also carries the biggest price tag coming in at double the price as its predecessors. Is it justifiable? I think so especially if you’re going to buy just one. Have a look at the first 100 pages compliments of the publisher and do your own math. Pretty ballsy, but only a book so big could offer such a bonus. Preview the book>>here. And please let us know your thoughts below.